Want to catch flathead like this? Read this article! LATE last year I wrote a piece on catching large flathead in the shallows on soft plastic stick baits. This method had been developed by my friend Chris Metcalfe and was proving very effective on big flathead over 70 cm long when fished in quite shallow water. 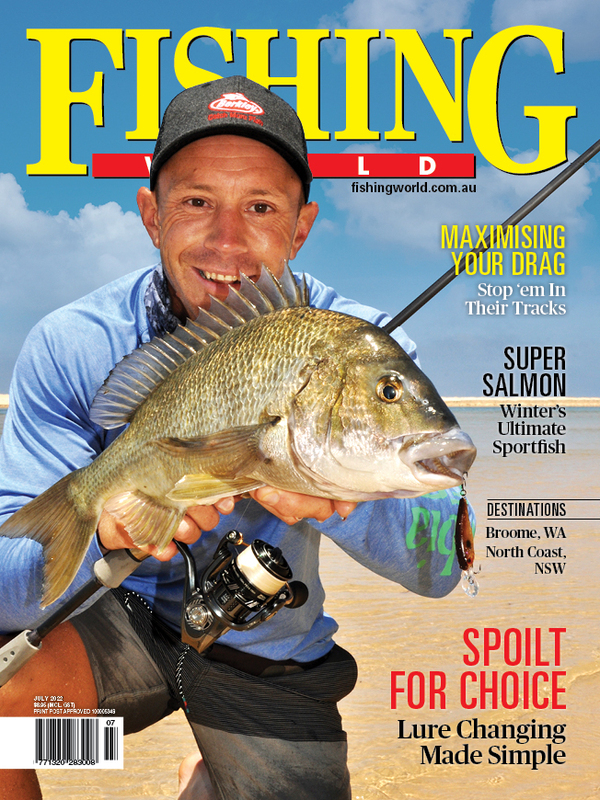 This article generated considerable interest and plenty of other keen anglers have had success with similar lures in estuaries well away from the Gold Coast. This article here is aimed at giving another update into a few new things we have tried, and a few rigging developments that have helped us over the last year when it comes to catching flathead on lures. In simple terms there are two types of flathead fishing with lures; vertical methods and horizontal methods. A typical vertical method is jigging soft vibes in deep water. Casting large soft plastic stick baits is an example of a horizontal method. Refining a technique requires it to be dissected, perfected, adapted and enacted! It’s all very well to have a brainstorming idea but you have to go through all the steps to make it work when you get out on the water. A typical example of this process happened to us with large quite hard soft plastic stick baits like the Silstar Slapstick. These lures were very effective when glided over the shallows where flathead were actively feeding, but often seemed to miss the hook-up. We rigged these lures with a pair of worm hooks with the points exposed, and I suppose we hooked and landed about half the fish that struck the lure. A treble hook rigged on a stinger seemed to offer very little improvement. There had to be a better way to achieve this while maintaining the integrity of the lure shape and profile. 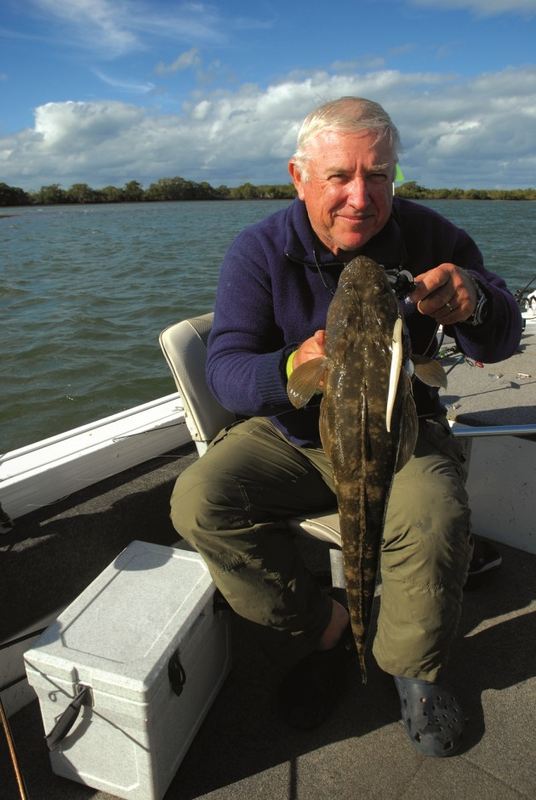 A willingness to experiment led to the capture of this great flathead. I remember Shane Compain in Darwin confronting a similar problem with large fish shaped plastics called Wedgetails and coming up with a very clever solution. Shane, using a sharp bladed knife, cut a line through the lure body from tail to about the gill section. From above, he cut down through the lure, again from just in front of the tail to near the gill section. This in effect split the lure body into 4 individual sections that were still attached to the head and tail of the lure. This clever innovation allowed the lure to effectively collapse and gives much improved hook exposure, which increased his hook-up rate on barramundi. We soon adopted the same method to large stick bait soft plastics and found this gave the large worm hook at the front a much better hook-up rate and many more fish were landed. In addition, it was much easier to rig two worm hooks by the same method. Another way I dissected the method was to try and eliminate the hardness of the lure to make a softer version to give easier hook penetration. Boiling most soft plastics in water for a minimal period alters the polymers and can make the lure softer. This method was commonly used to increase tail action on paddle tail plastics in Queensland’s barra dams. When some stick baits were boiled they became softer, had more action and an improved hook-up rate. This was a matter of constant trial and error. Boiling lures can be looked on by non fishing spouses as completely weird, and if you boil them for too long they form a sludgy pile of goop on the bottom of the pan! The next part of my plan was to look for slightly different styles of lures that were softer. Eel imitations get little use in most Australian fisheries, but a quick search on the Internet gave me a few choices to look at. The Storm Jigging Eel was one lure that came up. When the weighted head was removed and it was rigged on a large worm hook this became a deadly flathead lure in the shallows. It was very soft and pliable and had an excellent hook-up rate, and these are my personal favourite shallow water big flathead lure. The above are just a few examples of how a thinking approach and careful innovation can always improve your results. One of the interesting things that has happened in my local waters is that the shallow water plastic stick baits have become less and less effective over time. 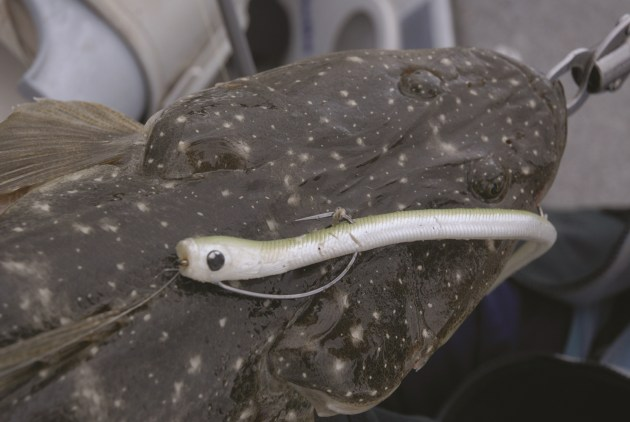 A lot of these flathead tend to live on the same sand flats for long periods of time, and like most animals tend to remember frightening life threatening events, such as being caught on a large white stick bait! 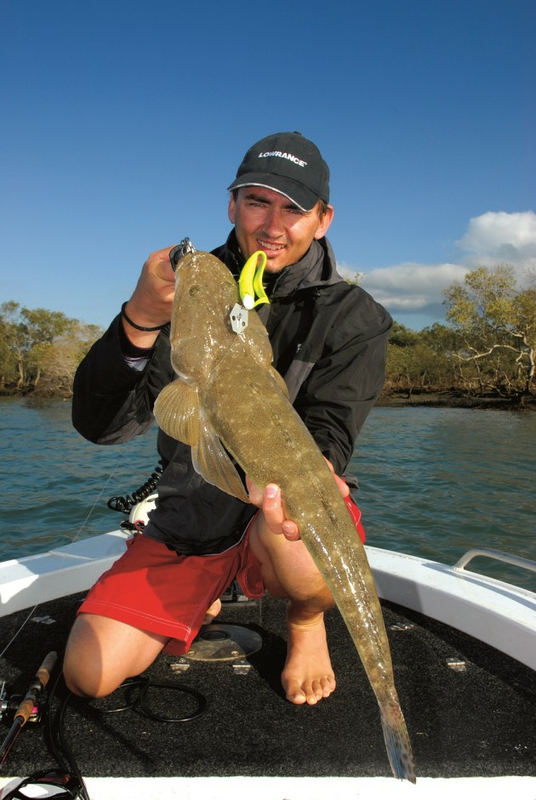 Most of these sand flats have been flogged day after day by anglers casting long white lures, and while flathead are still caught by this method, it is pretty clear that catching a big flathead for the second time is not that easy, particularly with the same method! In my local waters the catch rate of big flathead on plastic stick baits has dropped off markedly. The fish are still present but they are a lot more gun shy than they used to be. I was recently whiting fishing on a shallow sand bank behind the popular Wave Break Island. I nearly trod on half a dozen flathead in the 80 to 90 plus bracket, and I could cast lures close to the fish. Their rampant enthusiasm had definitely waned and I only got a few tentative follows. Other shallow water refinements we have made relate to the tackle we are using to cast longer lures. A longer 7 to 8 foot rod increases casting distance, gives you a much longer "sweep" on the retrieve and also gives you a more effective striking tool. Similarly, going down to quite fine 10 pound braid and 10 kg fluorocarbon leader increases the casting range, decreases underwater line visibility and increases the number of bites. This can also allow the outfit to remain useful with smaller lighter lures at times when fish are quite fussy. Modifying your plastics can increase hook up rates. We also dissected a few of our other methods in the hope of improving the results. We do, at times, spend a fair bit of time trolling, and it soon becomes clear that lighter line and finer leader get more bites on the troll. But how far can you go before bite offs become an issue? In actual fact, for average fish of 45 to 60 cm bite offs are relatively uncommon. What I have found is that a lot of the bite offs occur when extra tension is applied to the fish. Trolling with 2 pound braid and 6 or 8 pound fluorocarbon leader on a long soft rod produces a lot of fish, probably more than you catch with 6 or 8 kg leader and 6 pound braid. Additionally, the lures tend to run a bit deeper and more effectively close to the bottom. If you play the fish softly and carefully with a soft rod it greatly reduces fraying of the leader, even in those fish that completely swallow the lure. It has been an interesting experiment with surprisingly few bite offs. Later in the season when bigger fish turn up in numbers a 15 cm length of 6 or 8 kg fluorocarbon added to the main leader gives extra reassurance. I’ve always been quite wary of different clips, but when trolling for flathead we regularly change from one lure to another, and the smallest Fastrac Clips have become a very useful tool that does not impart lure action at all. This small refinement gives you a bit more fishing time each trip, reduces leader loss and is very simple to operate unless you are legally blind! Another slight refinement that seems to add some benefit is adding one or two extra fine split rings to the back hook of most flathead trolling lures. Typical examples include the Zerek Tango Shad, Piggy Lures and the ever reliable Lively Lures Micro Mullet. This seems to help get more lip hook-ups as the small treble has much more swing and rotation when a fish hits it. In addition, there are some fabulous new trebles on the market to look at from Mustad, BKK and Owner. There is nothing sweeter on a flathead lure that a fine sharp treble hook. When it comes to soft plastics, we are constantly experimenting with jig head size, colour and shape. One style of jig head that has definite application in flathead fishing is the use of small flashing blades, as are found on small spinner baits. A thin willow blade under the chin of the lure is very effective with 4 and 5 inch stick baits in shallow water, and the addition of flashing Chatterbait blades to jig heads fished in deep water gives increased lure action and flash on the retrieve and can be deadly on big flathead in water from 8 to 20 metres in depth. We have also experimented with a wide range of small soft baits over the past twelve months. A relatively established lure that is catching a lot of fish and has excellent hook exposure is the Gulp Nemesis in most sizes. These have been extremely effective fish catchers in my boat. Soft Vibes have also grabbed a lot of our attention in the last twelve months, and recently have been extremely effective on both flathead and mulloway on the Gold Coast and in the Tweed River. One thing that I’ve learnt is that in deep water the retrieve for flathead is slow, boring, drab and deliberate. Barras and bass like erratic sharp movement most of the time and respond best when the lure sinks back to the bottom on a slack line. Flathead, in stark contrast, seem to prefer a lure that is lifted and flopped back to the bottom without any jerks or twitches. This can be quite a painful retrieve that is pure vanilla and lacks the anticipation and excitement of the retrieve used for barra. But flathead know how they like their lures served and in general this dull lift and drop works well on fish of all sizes. I like to use Zerek 95 mm Fish Traps, Samiki Vibes and Fuse Vibes. All of these are effective on flathead but don’t go overboard ripping and tearing with your retrieve styles. This style of retrieve also prevents the lure fouling itself up with inter connecting hooks. 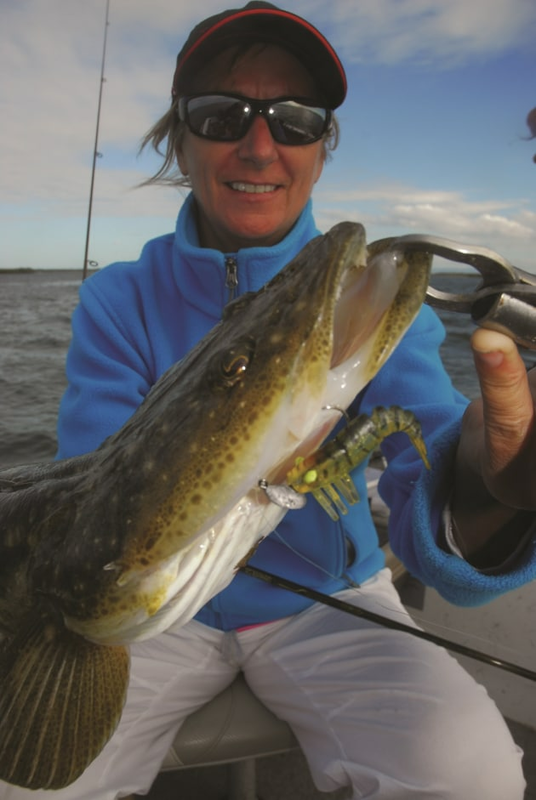 Prawn imitations can be deadly flathead lures. One of the most productive lure types I’ve used in the past two seasons is prawn imitations, and I am a huge fan of this style of lure. I’ve found a small Zerek Prawn to be a deadly lure when conditions are quite shut down, and I can generally find a few fish even in the most trying conditions with these lures. I use them on 8 pound leader and light braid on a long soft rod and they have proven deadly time and time again. It takes a bit of practice to perfect their use but the bites are quite aggressive. Fish hunting prawns are obviously tuned into prawn behaviour, meaning they will always have a swift fast attack, and this gives a very good rate of hook-up. A few other refinements we have made to the flathead lure box include using two lures on the one line. This gives extra casting distance and is at times vey effective. Combinations include a hard body and a soft plastic, a large and small soft plastic or a pair of prawn imitations. I need to do a lot more experimentation with this. I have also changed the hooks on some blades to inline single hooks. We have also increasingly been using weedless hook rigs and soft plastics in shallow weedy area with quite good success. This has been done with an extensive range of plastics and has quite a secure hook-up rate. Overall, flathead fishing with lures is a constant source of experimentation, and it is always very satisfying when a few new ideas or recycled old ideas come together to make one particular lure or method more effective.